3rd International Conference on Wound Care, Tissue Repair and Regenerative Medicine : Vydya Health - Find Providers, Products. 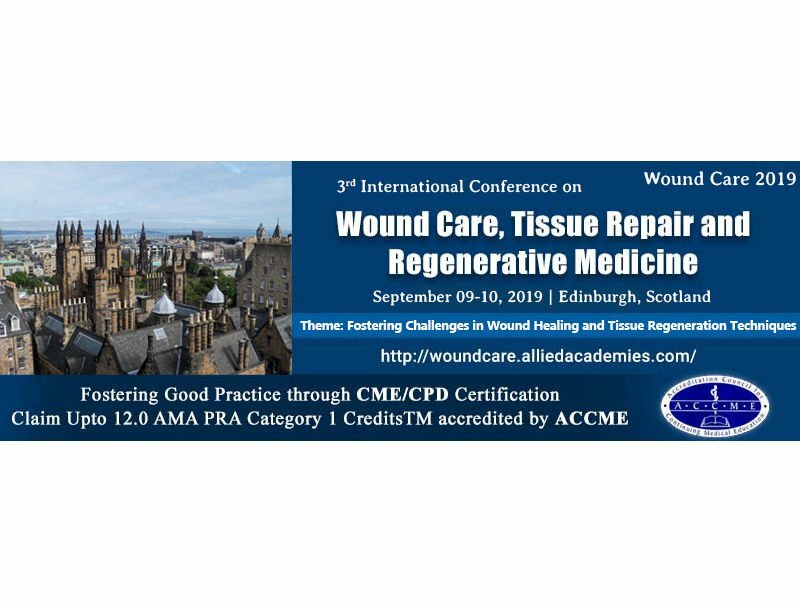 3rd International Conference on Wound Care, Tissue Repair & Regenerative Medicine in collaboration with BALWMA (Balkan Wound management Association) slated for September 09-10, 2019 at Edinburgh, Scotland with focus on wound care research, Skin, Wound Care, Nursing and Tissue Science attracting people from USA Europe Asia Pacific and Middle East. The Theme of the conference is “Fostering Challenges in Wound Healing and Tissue Regeneration Techniques”. Wound Care Conferences 2019 is your best opportunity to reach the largest assemblage of participants around the globe. Join, conduct presentations, exchange information’s and connect with the current eminent and potential scientists to explore more on wound care, wound healing, tissue repair and regenerative medicine, make an impact with new drug innovations, developments and receive name recognition and certificates signed by our world class eminent organizing committee at this two days event. World renowned speakers, the most advanced and recent techniques, developments and the newest updates in wound care,tissue repair and regenerative medicine are hallmarks of this conference.